Some inventions strike us as weird, others stupid and still others as simply unnecessary. Occasionally, however, something seemingly silly turns out to address a real need. Take Doggles, the goggle-style sunglasses that aren’t just for the pulchritudinous pooch on the go. These rover Ray-Bans do more than protect your pet from the sun’s glare: They also keep out dust, debris and wind, block UV rays and assist in relieving ocular medical conditions, such as a rare autoimmune disorder that prevents dogs’ eyes from producing tears . So, who’s the Fido behind those Foster Grants? Besides doing their duty (ahem) for hounds at home, Doggles shielded U.S. dogs in uniform from windblown sand in Iraq. We can’t say for sure if the helicopter-hopping hound that accompanied SEAL Team Six on its mission to take out Osama bin Laden wore them, but it seems likely. Efforts are also under way to supply the shielding specs to search-and-rescue dogs. 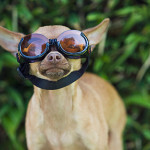 Doggles, LLC has sold millions of pairs to pooches at $19.90 a pop . That’s what we call making your bones. In the next section, we’ll examine the merits and pitfalls of solving problems with blanket solutions. Next Next post: Naming your new business baby – take special care!